The ARTS Card is your ticket to big savings. For a donation to the Arts and Education Council of $50 per year (or, $4.17 per month), you get access to discounts on hundreds of performances, camps and even hotel stays year-round. Discounts are up to the participating organization, but often are as much as 50% off, so the card quickly pays for itself. 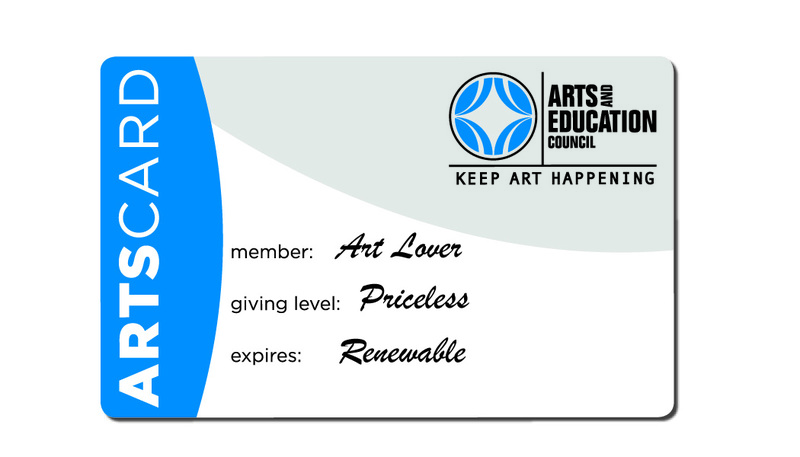 With an ARTS Card, you experience more art at a price you can afford - all while making a difference in our community. Using the ARTS Card is as easy as give, get, go. 1. Give $50 per year (or, $4.17 per month) to the Arts and Education Council. 2. Get your ARTS Card in the mail and check out the calendar of upcoming events for opportunities and redemption instructions. For events with special ticket links or access codes, we will send those to you via email. 3. Go enjoy the events you make possible with your gift to the Arts and Education Council. Want a discount at an organization not on the list? Let us know. Make a donation of $50 or more per year (or, $4.17 per month) to the Arts and Education Council and we will take care of the rest. Please see our Know & Go Calendar for ARTS Card pricing. Quantity limits to ARTS Card offers are at the discretion of the participating organization. ARTS Card holder discounts are not recognized by electronic ticket outlets unless specified in offer detail and may not be used to purchase subscription tickets. Expired ARTS Cards will not be accepted.